The bolted design of basic ladder-type frame side members is welded together by means of cross members both at the front and at the back. The ramp angle of 132° or 138°, depending on a wheelbase version, approach and departure angles of 37° or 35° respectively and a vertical step of 600 mm are sufficient proof that T 810 forms its own class of vehicles in terrain where no other vehicle design can be used. Primarily, this is thanks to the TATRA RIGID portal axles and, in particular, their mounting and suspension. The front rigid portal axle with gear ratio of 2.294 and hub reduction gear of 2.437 is equipped with electro-pneumatically controlled axle differential lock and a WABCO air disk brake. The axle is led through the upper pair of side guide rods and the lower triangle suspension with anchoring to the vehicle frame. It is suspended by coil springs with telescopic shock absorbers with a hydraulic stop and a anti-roll bar. Thanks to this design, the whole vehicle steering system does not require tugging the steering wheel to the left or right, when overcoming both longitudinal and transversal ground unevenness, which is common with other designs. 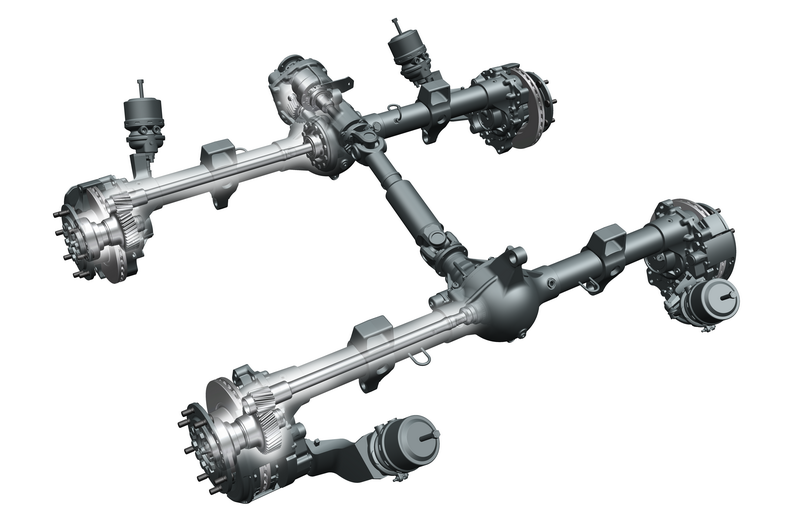 The central and rear TATRA RIGID portal axles form a tandem pair. 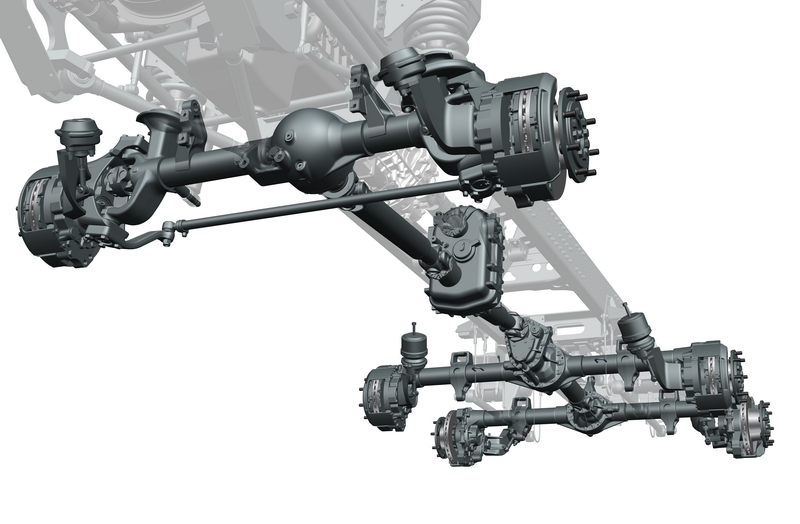 Both axles are equipped with electro-pneumatically controlled axle differential locks and WABCO disk brakes. 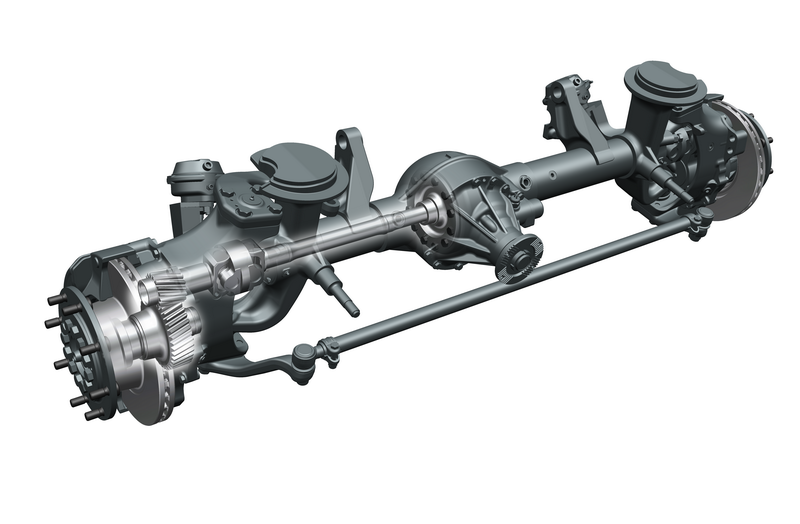 In addition, in the central axle there is an inter-axle differential with an electro-pneumatic lock and an outlet for the rear axle drive. The tandem pair is guided by means of six longitudinal guide rods anchored to the vehicle frame and suspended by a pair of 16-leaf springs.